Last weekend, an unstoppable “force” took the world by storm: the appearance of Rogue One in theaters, the latest film in the Star Wars franchise, setting new box office records just in time for the Christmas holiday season. Moviegoers have long enjoyed the holiday releases of Star Wars films over the years, although the famous sci-fi franchise has a much more peculiar history of its involvement with Christmas time. In fact, one incident that remains in infamy among Star Wars fans involves a holiday special that, according to many, was so bad that George Lucas did his best to bury any memory of it. Though it would only air once, the shock wave of campiness that resulted was more than enough enough to earn the program its own place in history as one of the worst, and most bizarre Christmas specials ever broadcast on live television. Our story begins a long time ago in 1978, in a faraway land called CBS studios, where executives had just completed an agreement to partner with Lucas to produce a Star Wars-themed Christmas special. The timing seemed perfect: it was only a year after the first Star Wars had appeared in theaters, and excitement for the upcoming sequels was fresh in the public mind. Cast members including Mark Hamill, Carrie Fisher, and Harrison Ford were tapped to reprise their roles as the famous characters whose role within the rebel alliance helped thwart the evil Darth Vader’s plans to help broaden the operations of The Empire. However, for a more light-hearted televised Christmas special, it was decided by Lucas and the crew that the story would center around Han Solo’s first mate aboard the Millennium Falcon, Chwebacca, and his fuzzy family of Wookies. In doing so, the stage was already being set for some of the more memorable, and perhaps downright painful sequences featured within the program. For instance, as the special begins, viewers are introduced to Chewbacca’s relatives, featuring a loving family scene of the Wookies in their element. However, as the Wookies go about their holiday business, the plot unfolds with no subtitles, resulting in a bizarre display that lasts for nearly ten minutes. Shortly afterward, we are shown Chewbacca’s father being given a Christmas gift from a friend, which involves a bizarre virtual reality adult fantasy sequence, complete with the sensual sounds the elder Wookie’s joyful grunting in response to the weird VR experience (this also lasts an awkward seven minutes or so). The program isn’t entirely without its high points, of course. Although the general oddity of the program mostly overshadowed its merits, one notable element had been that the 1978 special marked the first appearance of the character Boba Fett, who is introduced during an animated sequence viewed by Lumpawarrump, Chewie’s son, which is in its own right very reminiscent of an acid trip. After the program aired, George Lucas admitted that he didn’t have any significant degree of involvement with the production, which contributed to its overall poor quality. However, despite having limited involvement, Lucas was ratted out a few years ago by the Patty Maloney, the actor who portrayed Lumpawarrump, who stated in 2008 that Lucas was, at very least, sent dailies of each day’s shooting for approval. Thus, one would assume that he had to have seen the debauchery that was underway. All things considered, the special wasn’t really all that bad. If anything, the bizarre wonderland-retro-fantasy cartoon sequence remains notable, both for the animation itself, and its introduction of Boba Fett. But apart from all this, in an era where the campiest elements of decades past are viewed with a certain degree of awe and enjoyment by modern audiences, maybe this “low point” in the Star Wars franchise is still something worthy of enjoying around the holidays. Fortunately, despite Lucas’s best efforts, copies of the special still exist, and it can be viewed on YouTube in its entirety. 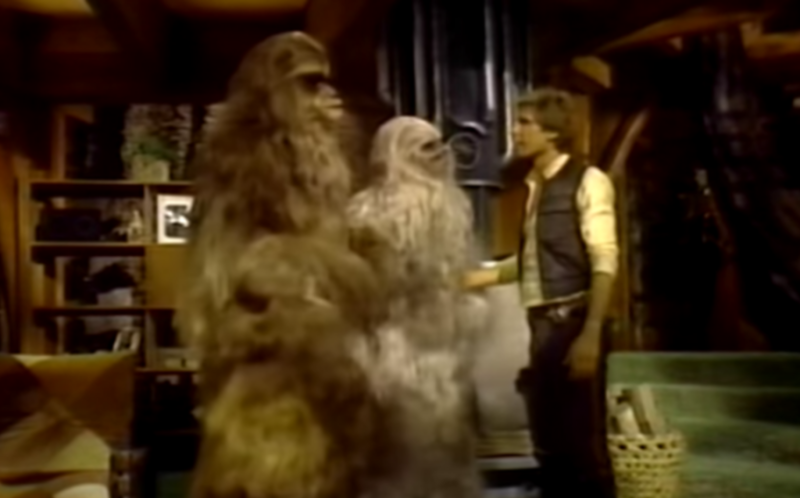 Thus, whether it’s amidst the ranks of devout internet archaeologists excavating the worst moments in television history, or even the most devout Star Wars fans of our time, the 1978 special still marks a special moment in Star Wars history, for better or worse.